Training Material for building better teams is designed for supervisors and managers to create better team chemistry with their employees. Train your organization how to establish team norms, how to work as a team, what type of team players they are, building team trust and more! 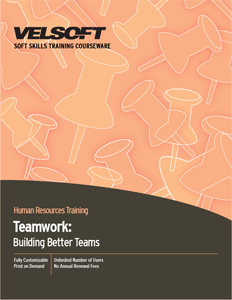 Seeing is Believing This sample manual to teach Building Better Teams is in MS Word format. Teams can make the difference in an organization's success. If you want to teach students how to establish team norms (including ground rules and contracts), build team trust, create team spirit, communicate better, and become a great team player, this one-day course is perfect for you. These interactive training materials include a pre-assignment, detailed instructor guide, student guide, pre and post assessments, quick reference guide, and more. If your students like to learn from their mobile devices, ask about our blended learning opportunities.